There are two ways of "generating" electricity on the car: 1. Magnetically, 2. Chemically. The first method is that used in a generator, in which wires are rotated in a "field" in which magnetic forces act. The second method. is that of the battery, and the one in which we are now interested. If two unlike metals or conducting substances are placed in a liquid which causes a greater chemical change in one of the substances than in the other, an electrical pressure, or "electromotive" force is caused to exist between the two metals or conducting substances. The greater the difference in the chemical action on the substances, the greater will be the electrical pressure, and if the substances are connected together outside of the liquid by a wire or other conductor of electricity, an electric current will flow through the path or "circuit" consisting of the liquid, the two substances which are immersed in the liquid, and the external wire or conductor. As the current flows through the combination of the liquid, and the substances immersed in it, which is called a voltaic "cell," one or both of the substances undergo chemical changes which continue until one of the substances is entirely changed. These chemical changes produce the electrical pressure which causes the current to flow, and the flow will continue until one or both of the substances are changed entirely. This change due to the chemical action may result in the formation of gases, or of solid compounds. If gases are formed they escape and are lost. If solids are formed, no material is actually lost. Assuming that one of the conducting substances, or "electrodes," which are immersed in the liquid has been acted upon by the liquid, or "electrolyte," until no further chemical action can take place, our voltaic cell will no longer be capable of causing a flow of electricity. If none of the substances resulting from the original chemical action have been lost as gases, it may be possible to reverse the entire set of operations which have taken place. That is, suppose we now send a current through the cell from an outside source of electricity, in a direction opposite to that in which the current produced by the chemical action between the electrodes and electrolyte flowed. If this current now produces chemical actions between electrodes and electrolyte which are the reverse of those which occurred originally, so that finally we have the electrodes and electrolyte brought back to their original composition and condition, we have the cell just as it was before we used it for the production of an electrical pressure. The cell can now again be used as a source of electricity as long as the electrolyte acts upon the electrodes, or until it is "discharged" and incapable of any further production of electrical pressure. Sending a current through a discharged cell, so as to reverse the chemical actions which brought about the discharged conditions, is called "charging" the cell. Cells in which an electrical pressure is produced as soon as the electrodes are immersed in the electrolyte are called it "primary" Cells. In these cells it is often impossible, and always unsatisfactory to reverse the chemical action as explained above. Cells whose chemical actions are reversible are called "storage" or "secondary" cells. In the "storage" cells used today, a current must first be sent through the cell in order to cause the chemical changes which result in putting the electrodes and electrolyte, in such a condition that they -will be capable of producing an electrical pressure when the chemical changes caused by the current are complete. The cell now possesses all the characteristics of a primary cell, and may be used as a source of electricity until "discharged." It may then be "charged" again, and so on, the chemical action in one case causing a flow of current, and a reversed flow of current causing reversed chemical actions. We see from the above that the "storage" battery does not "store" electricity at all, but changes chemical into electrical energy when "discharging," and changes electrical into chemical energy when "charging," the two actions being entirely reversible. The idea of "storing" electricity comes from the fact that if we send a current of electricity through the cell for a certain length of time, we can at a later time draw a current from the cell for almost the same length of time. Fig. 3. A complete element, consisting of a positive and negative group of plates and seperators ready for placing in the har rubber jars. Three things are therefore required in a, storage cell, the liquid or "electrolyte" and two unlike substances or electrodes, through which a current of electricity can pass and which are acted upon by the electrolyte with a chemical action that is greater for one substance than the other. In the storage cell used on the automobile today for starting and lighting, the electrodes are lead and peroxide of lead, and the electrolyte is a mixture of sulphuric acid and water. The peroxide of lead electrode is the one upon which the electrolyte has the greater chemical effect, and it is called the positive or ''+" electrode, because when the battery is sending a. current through an external circuit, the current flows from this electrode through the external circuit, and back to the lead electrode, which is called the negative, or electrode. 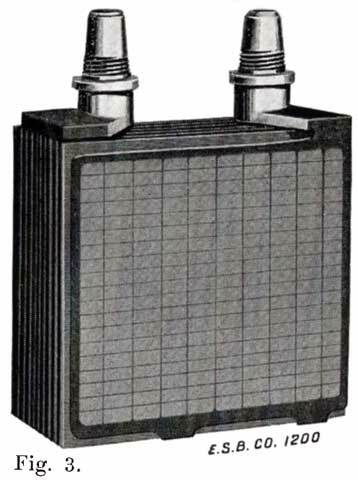 When starting and lighting systems were adopted in 1912, storage batteries had been used for many years in electric power stations. These were, however, large and heavy, and many difficult problems of design had to be solved in order to produce a battery capable of performing the work of cranking the engine, and yet be portable, light, and small enough to occupy only a very limited space on the automobile. As a result of these conditions governing the design, the starting and lighting battery of today is in reality "the giant that lives in a box." The Electric Storage Battery Company estimates that one of its types of batteries, which measures only 12-5/8 inches long, 7-3/8 wide, and 9-1/8 high, and weighs only 63-1/2 pounds, can deliver enough energy to raise itself to a height of 6 miles straight up in the air. It must be able to do its work quickly at all times, and in all sorts of weather, with temperatures ranging from below 0° to 100° Fahrenheit, or even higher. The starting and lighting battery has therefore been designed to withstand severe operating conditions. Looking at such a battery on a car we see a small wooden box in which are placed three or more "cells," see Fig. 1. Each "cell" has a hard, black rubber top through which two posts of lead project. Bars of lead connect the posts of one cell to those of the next. To one of the posts of each end cell is connected a cable which leads into the car, and through which the current leaves or enters the battery. At the center of each cell is a removable rubber plug covering an opening through which communication is established with the inside of the cell for the purpose of pouring in water, removing some of the electrolyte to determine the condition of the battery, or to allow gases formed within the cell to escape. Looking down through this opening we can see the things needed to form a storage battery: the electrolyte, and the electrodes or "plates" as they are called. If we should remove the lead bars connecting one cell to another, and take off the black cover, we should find that the posts which project out of the cells are attached to the plates which are broad and flat, and separated by thin pieces of wood or rubber., If we lift out the plates we find that they are connected alternately to the two lead posts, and that the two outside ones have a gray color. If we pull the plates out from each Other, we find that the plates next to the two outside ones, and all other plates connected to the same lead post as these have a chocolate-brown color. If we remove the jar of the cell, we find that it is made of hard rubber. Pouring out the electrolyte we find several ridges which hold the plates off the bottom of the jar. The pockets formed by these ridges may contain some soft, muddy substance. Thus we have exposed all the elements of a cell,--posts, plates, "separators," and electrolyte. 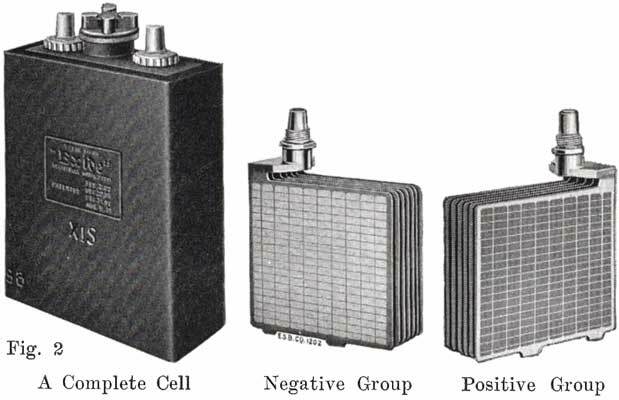 The gray colored plates are attached to the "negative" battery post, while the chocolate-brown colored ones are connected to the "positive" battery post. Examination will show that each of the plates consists of a skeleton metallic framework which is filled with the brown or gray substances. This construction is used to decrease the weight of the battery. The gray filler material is pure lead in a condition called "spongy lead." The chocolate-brown filler substance is peroxide of lead. We have found nothing but two sets of plates,-one of pure lead, the other of peroxide of lead, and the electrolyte of sulphuric acid and water. These produce the heavy current necessary to crank the engine. How this is done, and what the chemical actions within the cell are, are described in Chapter 4.